This is the 2018 schedule of Awa Odori dance festivals to be held in the Tokyo/Kanto area (Tokyo, Saitama, Kanagawa, and Chiba Prefectures) from June to October 2018. Nobody has compiled such a schedule so I did it myself. 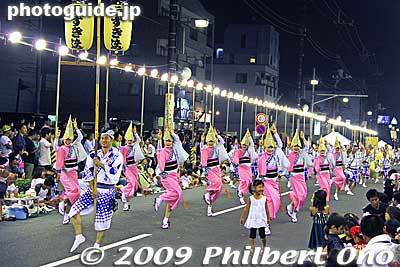 Most Awa Odori are held in the summer and a few are held in autumn. 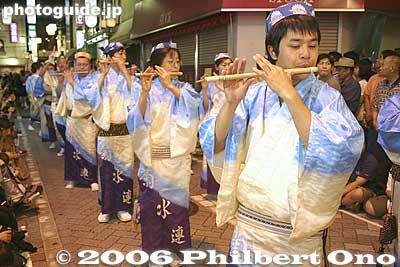 A few are held as part of a local festival like Tanabata. Most are held on two days, but a few are held only on one day. Some Awa Odori also have a festival eve events on the day before the Awa Odori. Summer can be very hot and humid. Be prepared with cold drinks, ice pack, etc. Rain (including typhoons) is always possible. A raincoat is better than an umbrella in crowds. Watch the weather and be prepared. Heavy rain or storms can cancel the event. Take pictures/videos only from the sidelines, do not enter the parade route to shoot. Do not use tripods. Strollers should not be used. And no smoking. Festivals can always be canceled in bad weather. Typhoons and rainstorms are always possible in summer. If the weather forecast looks bad, check whether the festival will be held. *Awa Odori in Tokushima is held annually on Aug. 12th–15th, 2018. 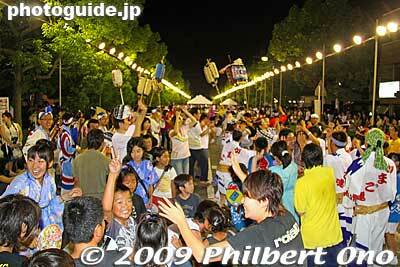 *Awa Odori scheduled for July 28–29 may be canceled due to the typhoon. ・Where: Hibiya Park, near Hibiya Station, Kasumigaseki Station, and JR Yurakucho Station. 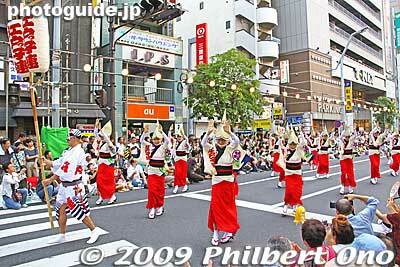 ・About: Only a few awa odori troupes appear in this parade of different festivals. ・Where: Near JR Koiwa Station, North Exit (JR Sobu Line). ・About: New awa odori that started four years ago. About 15 troupes. ・Where: Near JR Niiza Station (JR Musashino Line), South Exit, Furusato Niiza-kan hall area. 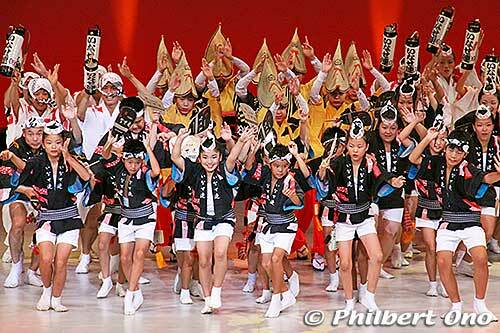 ・About: The Niiza Awa Odori was held for 32 years until 2014. It has been replaced by this Oedo Niiza Festival in 2015. It is now a local summer festival starting at 11:00 am and featuring a variety of stage entertainment and performers including a school band, hip hop, and samba dancers before climaxing with Awa Odori in the end during 5:05 pm–7:30 pm. About 20 Awa Odori troupes will dance. ・Where: Near JR Iidabashi Station (JR Sobu Line and subway lines), Kagurazaka Station (Tozai Line), Ushigome-Kagurazaka Station (Oedo Line). ・About: Held since 1972. Over 40 dance troupes and a total of 3,700 participants. The local troupe is Kagurazaka Kagura-ren with over 100 members. ・Where: Near Toritsu Kasei Station (Seibu Shinjuku Line). ・About: Held since 1979. About 10 troupes will dance along the narrow shopping street near the train station. Since the dance route is narrow, you can see the dancers up close. The dance route is cut in half (north and south) by the train line. Local troupe is Kasei-ren formed by the local neighborhood when the festival started. ・About: Kitamachi is a small neighborhood near Tobu-Nerima Station. Over 20 dance troupe including local troupes from Kitamachi: Ponpoko-ren and Jajauma-ren. ・Where: Near JR Mobara Station (JR Sotobo Line), East Exit, Sun City shopping street. ・About: Part of the Mobara Tanabata Matsuri to be held on July 27–29, 2018. On July 28, an opening ceremony will be held at 5:30 pm, and Awa Odori dancing will start at 6 pm. Eleven troupes will appear along a circular route starting and ending at Sogo Shimin Center. ・Where: Near JR Musashi Koganei Station, North and South Exits. ・About: There are multiple dance venues near the station, making it less crowded at each one. About 24 troupes will appear each evening. ・About: About 16 troupes. On July 15, they also hold an indoor performance (“Zomeki Yamato”) in Yamato Geijutsu Bunka Hall (¥1,500 paid seating). ・Where: Near Kojiya Station (Keikyu Airport Line). 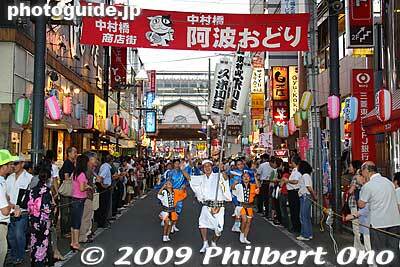 ・About: Two-day festival long a local shopping street with 10 dance troupes and 600 participants. ・Where: Near Higashi-Rinkan Station (Odakyu Enoshima Line, local train only, do not ride any express trains). ・About: Quite a big event with over 20 troupes on each day. Local troupes from Sagamihara are Higashi-Rinkan-ren, Hotaru-ren, Goraku-ren, Aun-ren, Hiyori-ren, and Issui-ren. ・Where: Near Naka-Meguro Station (Tokyu Toyoko Line and Hibiya Line). ・About: It’s a two-day summer festival. The first day (Aug. 4) features Awa Odori (27 troupes) and the second day (Aug. 5) has yosakoi dancers (33 groups). At 5:30 pm on both days, there’s an opening ceremony. They dance along the shopping streets next to the train/subway station, but the streets are narrow and it’s mostly standing room only. Normal people also walk along the streets so it can be hard to get good photos. But you get to see the dancers and musicians up close. ・When: Aug. 5, 2018, 4:30 pm–6:30 pm?? ・Where: Near Sayama-shi Station (Seibu Shinjuku Line). ・About: Two-day summer festival featuring a variety of performers and events. Fireworks on the first evening and Awa Odori on the second day from 4:30 pm–6:30 pm?? Eight Awa Odori troupes will dance. ・Where: Near Kumegawa Station (Seibu Shinjuku Line) and Yasaka Station (Seibu Tamako Line), Wing-dori, Shopping Promenade Yasaka. ・About: Local troupe is Kumegawa-ren. ・Where: Near JR Mitaka Station, South Exit (JR Chuo Line). 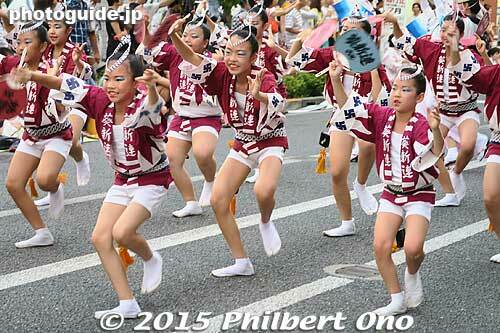 ・About: About 26 troupes parading on a straight road along the shopping street. 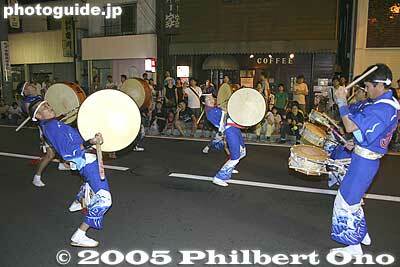 Many troupes are from Mitaka like Inokashira-ren, Mitaka-ren, and Rhythm-ren. ・Where: Near Shimo-Kitazawa Station, North Exit (Inokashira Line and Odakyu Line). ・About: Held along the Ichibangai shopping streets.There will be around 12 dance troupes on both nights, including Hifumi-ren and Yattoko-ren which are from Shimo-Kitazawa. One troupe will be for anyone to join in and dance (tobi-iri-ren). From 8:10 pm to 8:30 pm, each troupe will give a dance performance at designated places. Note that the streets are quite narrow with little room to sit. It’s basically a standing room-only festival. ・Where: Near Ontakesan Station (Tokyu Ikegami Line). ・About: A two-day dance festival with a Bon dance held on the first night (Aug. 18) and Awa Odori on the second night. There will be around five Awa Odori dance troupes. Most are quite famous in Tokyo. The local troupes includes Kusunoki-ren. ・Where: Near JR Koenji Station (JR Chuo Line) and Shin-Koenji Station (Marunouchi subway line). ・About: Tokyo’s biggest Awa Odori with over 50 dance troupes each evening and a million spectators over the two days. There are multiple venues or roads where they dance. The larger roads are very crowded, but the narrower parade paths are less crowded. Go early if you want to sit in a good spot. ・Where: Near JR Minami-Koshigaya Station (JR Musashino Line) and Shin-Koshigaya Station (Tobu Skytree Line). ・About: Big Awa Odori with about 80 troupes over the festival period. Four dance venues including a stage and indoor hall. Festival eve on Aug. 24 at 7:00 pm–9:00 pm at the Koshigaya Community Center. They will also have dancers performing inside the Koshigaya Community Center on both days. ・Where: Near JR Otsuka Station, South Exit (Yamanote Line), Shin-Otsuka Station (Marunouchi Line). ・About: For the festival eve the night before on Aug. 24 at 5:00 pm, dances will be performed in the Minami Otsuka Hall. 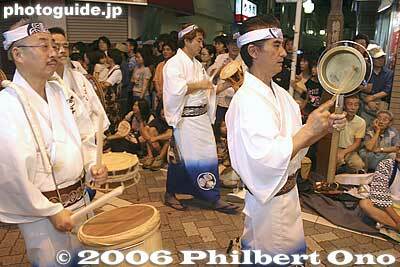 This is one of the samller and less crowded Awa Odori in Tokyo. Probably because it is held at the same time as much bigger Awa Odori. ・Where: Near Keio Yomiuriland Station (Keio Line). ・About: Dance venues are in front of the train station and nearby streets. Not crowded at all. ・Where: Near Kita-Urawa Station (JR Keihin-Tohoku Line). ・About: This is the finale of the local Urawa Matsuri festival held since July. A music parade first starts at 4 pm before the Awa Odori at 5 pm. About 16 troupes appear. ・Where: Near Nakamurabashi Station (Seibu-Ikebukuro Line). ・About: Held annually on the first weekend of Sept. There will be 12 dance troupes and 600 people in the parade. On the festival eve on Sat. the day before, they will have entertainment and flea market from 2:30 pm to 8:30 pm. ・When: Held annually on Sept. 22–23, starts at 6:45 pm and ends at around 9:00 pm. ・Where: Near Hatsudai Station (Keio Line). ・About: Dance route is about 1 km long, starting near Hatsudai Station. One long route. Started in 1970 to join the Yoyogi Hachimangu Shrine’s main festival and revitalize the shopping street. Local troupes include Hatsuda-ren, Chibikko-ren, Fuji-ren, Yiko-ren, and Koburyu-ren. ・Where: Near Keikyu Kawasaki Station (Keihin Kyuko) and JR Kawasaki Station (JR Keihin Tohoku and Tokaido Lines). ・About: Started in 1986. About 15 troupes (over 600 performers) will dance. ・About: Festival featuring not only awa odori, but also taiko drummers. Misato Park is on the border with Katsushika Ward’s Mizumoto Park in Tokyo. Awa Odori (阿波おどり or 阿波踊り) – Dance of Awa Province. “Awa” is the old name for present-day Tokushima Prefecture where the dance originated. “Awa” does not mean “bubble” (泡) in this case. 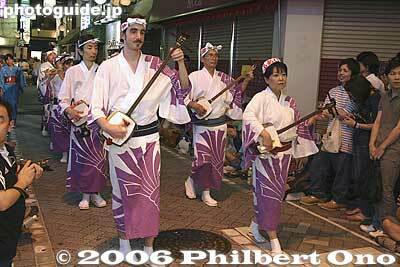 “Odori” means “dance.” It is based on the bon dance to welcome returning spirits of the deceased. ren (連) – Awa Odori dance troupe. The troupe’s name is tagged with “ren” at the end. A few troupes use a different tag instead of “ren.” A troupe consists of child, male, and female dancers and musicians. At the head is a pole lantern bearing the name of the troupe. 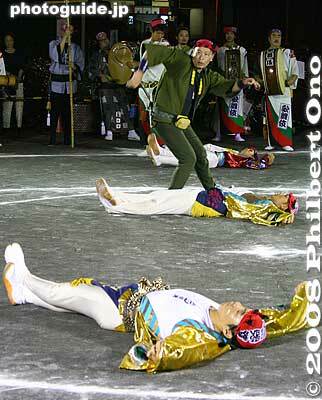 “Jimoto-ren” (地元連) is a troupe from the place where the Awa Odori is held. And “shotai-ren” (招待連) are invited troupes. 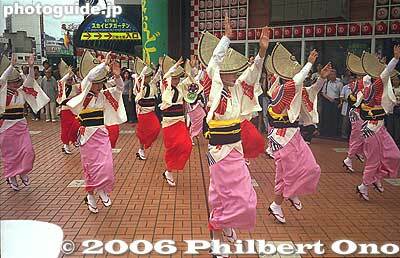 Niwaka-ren (にわか連) – Dance troupe for anyone to freely join in and dance (tobi-iri sanka). No special costume required. Easy to spot since they wear no uniform and look disorganized. 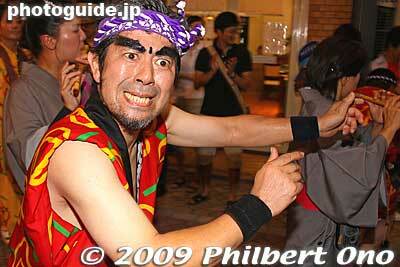 Some Awa Odori festivals have a Niwaka-ren. Or sometimes at the end, anyone can join in with the dance troupe. 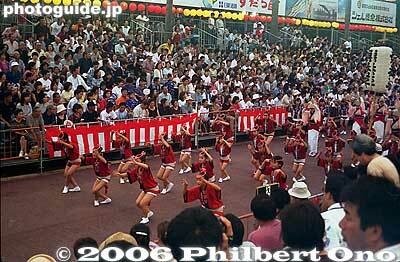 embujo (演舞場) – Dance venue where the troupes dance for spectators. This is usually a section of a street or large avenue. There may be bleachers or just a sidewalk where people can sit and watch. The bleachers are for paid seating. The venue may also be called “kaijo” (会場) which is a generic term for venue and may be numbered. 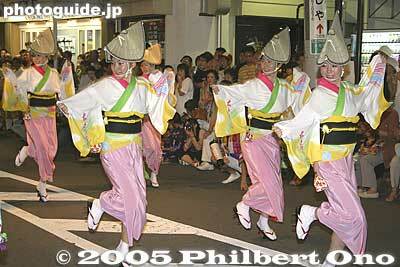 nagashi-odori (流し踊り) – Dancers dance while moving down the road in a parade. kumi-odori (組踊り) – Instead of moving in a parade, the dancers perform in one location for a prolonged period around 15-20 min. It could be a special area along the parade route or a stage. Often performed as the final number. 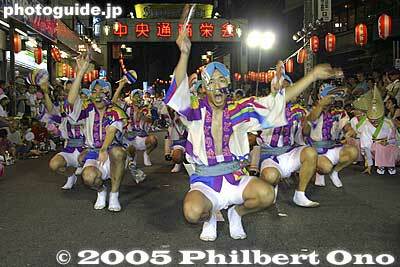 otoko odori (男踊り) – Men’s dance where they crouch low with the knees pointed outward. They usually wear a happi coat, shorts, and tabi socks. They may also dance with an uchiwa fan or paper lantern. Children and women can also dance the men’s dance. In the troupe, otoko odori usually appears before the onna odori. onna odori (女踊り) – Women’s dance. They wear a yukata, crescent-shaped hat, and wooden geta clogs. They dance in various formations while hopping on their clogs. Elegant-looking and the troupe’s main members. “Yatto-sa! 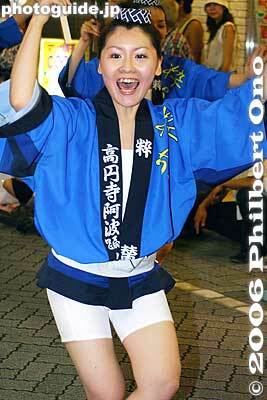 Yatto-sa!” (ヤットサーヤットサー) – “Yatto-sa, yatto-yatto, yoisa, yatto-sa!” A dance cheer often shouted by dancers. It means, “Long time no see! How have you been?” This is not normal Japanese. yakko odori (やっこ踊り) – Kite dance with an acrobatic dancer miming as a kite controlled by a kite handler with an invisible string. Humorous and dramatic especially when the kite does cartwheels and somersaults. Only a few troupes perform the kite dance. narimono (鳴り物) – Musicians. They appear at the end of the dance troupe and consist of flute players (fue 笛), shamisen players (三味線), bell player (kane 鉦) who sets the rhythm, and taiko drummers at the end.